Welcome to Flawed yet Functional! Earlier in the year, I listed one of my goals of this blog was to create a place of encouragement for my readers. I’ve been contacted in the last few weeks by people at various stages in their life that need some encouragement and help changing their diet. I am thrilled to try to offer what I know. 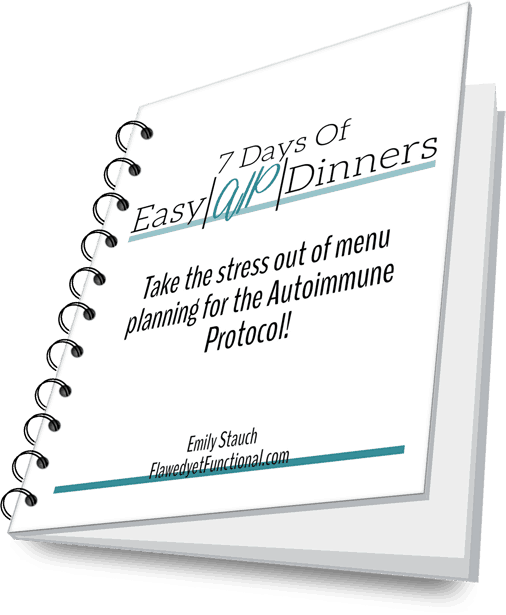 One area that pops up is packing a lunch that is AIP or Paleo approved but can be eaten on the go. Today I’d like to show you my formula for packing an AIP or Paleo sack lunch. One of the people I’ve been chatting with is about to head off to her freshman year at college this fall. About a month ago, she was just diagnosed with some severe allergies: wheat, dairy, egg, soy, to name the majors. Yikes! What a blow to take when so much is already changing in your life! This post is aimed at her, but works for anyone who needs to pack a sack lunch on an AIP or Paleo diet. I make sure my sack lunches cover 5 food categories: protein, vegetable, fruit, crunchy side, and snack. My goal is a filling, nutritious lunch with a little sweet treat. 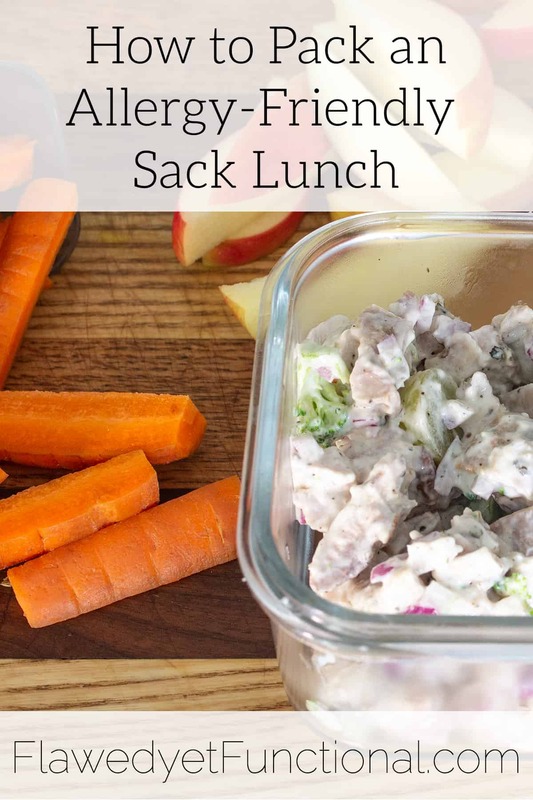 A sack lunch is just so much more palatable if you know there’s a goody in there rather than trying to make yourself eat a bag of vegetables. Pack what you know nourishes your body but pack to your preferences too! First, a good, insulated lunch box is key to keeping your lunch fresh and safe to eat once lunch time rolls around. I use this lunch box to pack my husband’s lunch everyday. He doesn’t use the refrigerators at his office, and everything in the box stays very cold until lunch time. The key to this bag is the separate zippered pouches that hold the ice packs on both the top and bottom of the bag. The ice packs are thin so they don’t take up too much space in the bag, allowing maximum space for food. 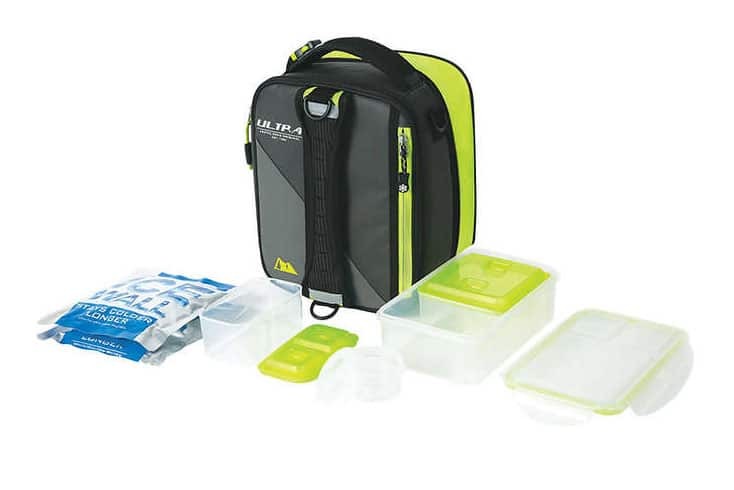 There is also an expandable section that you can open or close as your lunch requires. This is so handy as not all my lunch containers are the same size. If you don’t have a Costco membership, just find an insulated lunch bag and the thinnest reusable ice packs to go inside it. Vegetables contain a lot of fiber which will aid digestion and help fill you up. I usually stick to raw vegetables at lunch time. They take longer to chew which helps me to slow down to give my brain time to catch up to my food! The other perk is quick prep: wash, cut and toss in a container! For my blood sugar levels, it is best for me to have my fruit at lunch. I have no problem burning off the carbs in the afternoon, so I pack about a 1/2 cup serving of fresh fruit in my lunches. Opt for whole, fresh fruit over a processed fruit like a smoothie or fruit bar. Whole fruits have more fiber in them which allow the blood sugar to rise less. And it’s just better to eat whole food versus processed! There’s just something about a salty snack that is so satisfying, isn’t there? My salty option might just be for munching or might be a holder for my protein. Like almond crackers with almond cream cheese and smoked salmon or pork rinds for scooping up chicken salad. If you know you like a salty snack, pack one that fits in your diet so you aren’t tempted to cheat! Depending on how your day is structured, you may or may not need a snack. If you will be out of your house/dorm for most of the day, pack a snack just in case. I think it’s better to be prepared just in case you get hungry. It’s more cost effective to purchase a box of Larabars from the grocery store than buying them individually from a convenience store! Those five pieces makes for a nutritious, satisfying lunch. Would you like some suggestions for what to pack together? I’m so glad you asked! 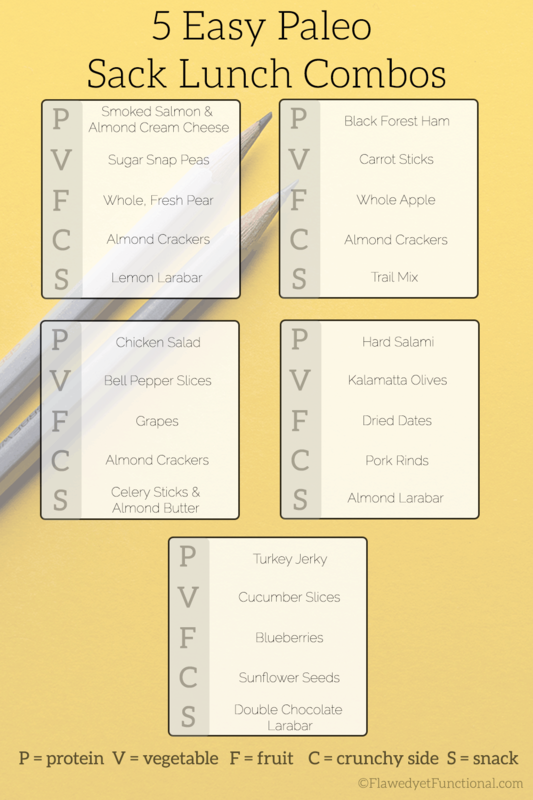 Below are five Paleo sack lunch combos that go together and require very little prep, most of the items can be purchased already made in the store, perfect for college students or anyone packing their lunch! If you are shopping for one person, I would not aim for a different lunch every day. Variety is not cost effective when only shopping for one. If that is your case, I would pick one or two of these options to eat for a week. For example, a box of Larabars come with 5 bars, so I would plan my snack for Monday through Friday’s lunches to be that flavor of Larabar. If you don’t like eating the same thing every day for lunch then pick two options an alternate back and forth for the week. Try to buy only what you will eat and avoid waste. That way your body and your budget will both be healthier through your efforts to pack a healthy Paleo sack lunch! What are your go-to sack lunches that don’t include a sandwich? Does the idea of lunch without bread shock you? Do you have a favorite raw veggie? I could always use more suggestions for vegetables!